Do you hate dental impressions? As technology in dentistry marches onward, we now have a solution for all of you that dread the dental mould/dental impression. There is nothing to like about that gigantic tray and all of the 'goo' that has to be held in the mouth for seemingly an eternity. 3D Digital Impressions has completely changed the dental experience if you are in need of a crown, bridge, implant, night guard, orthodontics and so much more.With the click of a button, a scanner the size of your electric toothbrush starts taking about 1500 digital photos of your mouth. There is a sensor inside the handle of the scanner that can detect the exact orientation of the scanner. The computer then proceeds to 'stitch' together the images like a quilt, creating a 3 dimensional replica of your mouth. Without having to touch the roof of the mouth, there is no activation of the trigger point of the gag reflex. The patient can also close their mouth to rest and swallow at any time during the scanning process since the scanner can pick up exactly where it left off. Most importantly, if the scan missed a spot, then it is only necessary to rescan that specific spot. Traditionally, we would have to retake an impression, putting patients repeatedly through the ordeal of another impression. 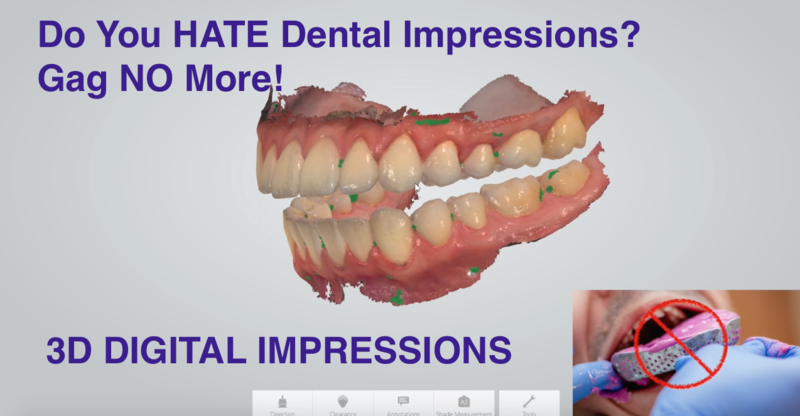 With 3D digital impressions, those traditional dreaded impressions are a thing of the past. Life is good again! For live footage of a 3D Digital Impression, check out our most recent episode on our YouTube Channel 'Tooth Savvy'.